The 4th of July weekend is the official opening of the annual art exhibit at the Grazhda and sumptuous brunch buffets every Sunday after Mass where you can experience traditional Ukrainian delicacies such as varenyky (dumplings), borshch, holubtsi (stuffed cabbage), not to mention the tastiest sweets -- all homemade dishes prepared by St. John parishioners. Because the area is frequented by many Ukrainians, especially in the summer months, a cultural center was established to perpetuate and preserve the historical and cultural heritage of the Ukrainian people and to offer them a stimulus for exchange and development of new ideas. 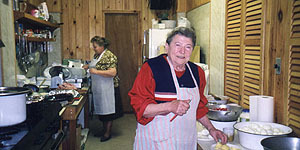 (RIGHT) Tonia Lorch and Chrystyna Lorch prepare Easter "Svyachene" breakfast for parishioners. For the past two decades, the Grazhda has accomodated varied cultural activities, such as lectures, folk art courses, concerts, art exhibitions, meetings and receptions sponsored by parishioners, the Ukrainian Artists Association, private individuals, and other organizations. For the past fifteen years, the Music and art Center of Greene County, Inc., has sponsored concerts of classical music featuring renowned performers, literary evenings, and folk art exhibitions. 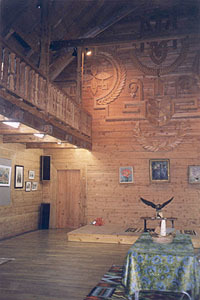 (BELOW) Grazhda Reception Hall, lower level. This composite photograph shows the full breadth of the wood-paneled room.